All Evie wants is to be normal. And now that she's almost off her meds and at a new college where no one knows her as 'the girl who went nuts', there's only one thing left to tick off her list...a boyfriend. But relationships can mess with anyone's head - something Evie's new friends, Amber and Lottie, know only too well. I loved this book because it explains exactly what it is like to have a mental illness. The wanting to be normal, thinking you're weak, thinking you're a bad person, despising yourself. Being afraid of what people would think if they really knew you. The not knowing what is you, what is your illness and what is your mefications. The pretending to be better when those around you think you _should_ be better - cause hey! They've been so understanding, right. How exhausting it is to fight, fight, fight every day, just to do the things others do as easily as breathing. How it limits your experiences, alienating you from the things "everyone" go through. Seeing the pain you cause your loved ones, just being near them, so you try to protect them from yourself. How difficult it is to explain that _knowing_ this and that is irrational doesn't make it any easier to deal with... And so much more. The book gives a really good insight into the complexities of mental illnesses, and can be recommended both for people who have an illness themselves, and for their family and friends. Terrific novel. I applaud the author for shining light on OCD and handling the topic with sensitivity yet balancing with humour and an unashamedly honest account of being a young women. If you are going to read this book, or perhaps you have already read it once and thinking of a second read, I'd seriously recommend giving the audible version a go. Bourne has done a fantastic job of writing this book, and Charlie Sanderson has done an amazing job at bring Evie's story to life. There are several scenes, filled with emotion and tension and I dont doubt that they would eevoke strong feelings from the author, but when you can hear Sandersons emotion behind Evies words it tugs at the heart more and gives the scene an extra depth. 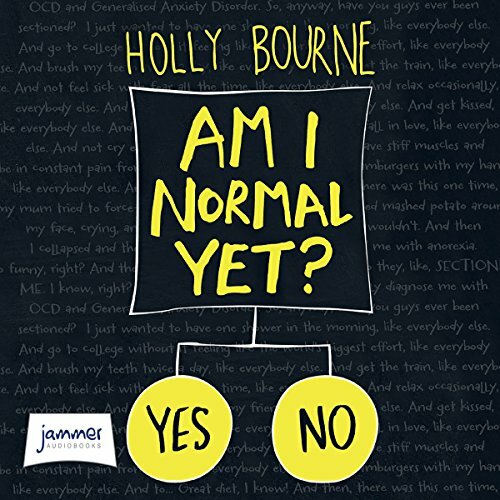 This is a fantastic look in to mental health and the way we perceive people and their illnesses, and whilst this is a serious subject which Bourne handles fantastically, she softens the seriousness with humour without dismissing the message. This is one of my favourite passages from the book and I feel it gives you an idea of Bourne's approach. “Mental illnesses have gone too far the other way. Because now mental health disorders have gone “mainstream”. And for all the good it’s brought people like me who have been given therapy and stuff, there’s a lot of bad it’s brought too. Because now people use the phrase OCD to describe minor personality quirks . “Oooh, I like my pens in a line, I’m so OCD. Oh my God, I was so nervous about that presentation. I literally had a panic attack. I’m so hormonal today. I just feel totally bipolar. The voice was absolutely lovely - but at times I felt sounded too young for the character and didn't fit right. it is a good book the only thing that i would criticise is how the narrator towards the beginning of the book makes everything sound like a question and it really annoys me. if you can persevere though the storyline is good and the issues brought up or significant. Audio reader is awful - really offputting voice. And the story itself feels cringy and unreal for teenagers.